When you connect to a network for the first time in Windows, Windows saves the network profile and assigns a name to it. Connections using Ethernet (wired) use a generic name such as Network 7 usually while wireless networks the SSID of the Wi-Fi network the device connected to. Some users and administrators may dislike the non-descriptive nature of wired network connections on Windows. Good news is that it is possible to rename network profile names to make them more descriptive on the operating system. The following guide was written for Microsoft's Windows 10 operating system but the process should work in previous versions of Windows as well. You can check the current name in the Network and Sharing Center on Windows or in the Settings application on Windows 10. Tap on Windows-I to open the Settings application. Go to Network & Internet > Ethernet or Wi-Fi depending on the connection type. The name of the network is displayed at the very top of the page. Tap on the Windows-key to activate the Start menu. Type Control Panel and select the result. The name is listed under "view your active networks". Windows administrators and users have two main options to change a network name. The first involves editing the Windows Registry using Local Security Policy. Note that Local Security Policy is only available in professional versions of Windows, e.g. Windows 10 Pro. I recommend that you back up the Windows Registry before you make any changes to it. Check out our Windows Registry backup guide to find out how to do that. Confirm the UAC prompt that is displayed. The next step requires some trial and error. 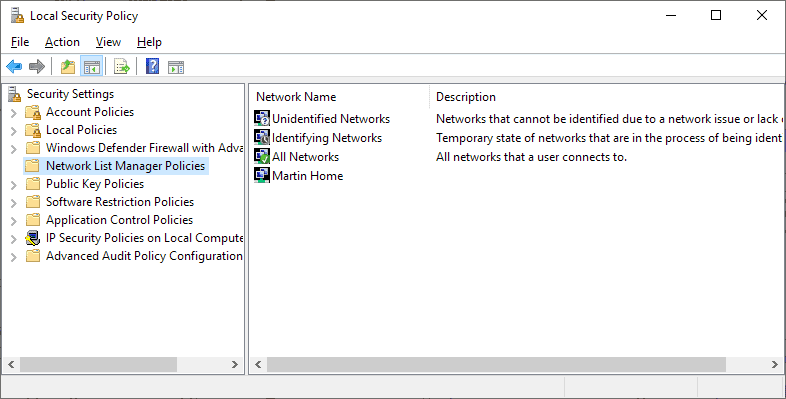 Windows lists all network connections with a unique ID and you need to click on each to check the ProfileName variable of it until you find the network name that you want to change. Double-click on ProfileName once you have found the right entry and type the new name of the network that you want used on the device. The change is only active on the device. The change takes affect immediately. You can verify that by opening the Settings app or the Network and Sharing Center to verify that the name change was successful. Repeat the process for any other network name that you want to change. As mentioned earlier, Local Security Policy is only available in professional versions of Windows. A limitation of this method is that you can only change the name of the connected network. Type secpol.msc and select the result from the list of results. This opens the Local Security Policy on the device. Tip: Check out our list of Windows msc files that you can run here. Select Network List Manager Policies on the left. Double-click on the name of the network the device is connected to at the time. A new window opens. Select "Name" under Name and add a new name for the network that you want used by Windows. The Registry option may not be as straightforward but it displays the list of all networks the device was connected to so that you may modify names of network the device is not connected to at the time as well. Changing network names is just a cosmetic change, though. Now You: have you changed network names on your devices? Find out how to change the name of any network that you connect to on a device running Microsoft's Windows 10 operating system. Hey Martin, just run ncpa.cpl and right-click the network connection, choose Rename. Cheers. You can change the name in the Network Center since.. ever.. I used to do it on Windows XP to mess with my friends, so I don’t know why you going through the effort of using regedit and gpedit. Thanks, Sander. Using ncpa.cpl, I just changed the name of my TAP-Windows Adapter V9 from “Ethernet 2” to “VPN”.